Finally darkness fell and after my father checked through the motel window, he proudly proclaimed the “haunting hour had arrived.” Finally! This was the cue to finally don the Barry Cooper brand TM Penguin costume that I was destined to wear this season. I surveyed myself in the mirror and my young mind had built up this image of Burgess Meredith from the TV show saying his trademark, ”Wak! Wak! Wak!” I figured the purple pin stripes would kind of snap against the fake tux jacket printed on the top. It did have that stupid Penguin logo (See previous post for my frustration). I carefully placed the plastic mask with monocle on my young face. Instead of seeing one of the Batman’s most formidable foes from his rogue’s gallery, I saw this bright vinyl jumpsuit with this creepy dead face staring back at me. My heart fell. I was not the smooth criminal I had planned to be. With renewed vigor, I was ready for bear. I prepared to march out of Room 213 and straight into that Harvest Pageant. I truly felt like I was the Penguin and even began to practice my “Wak!Wak!Wak!” just like the TV show. Robby, excuse me, The Penguin, was ready for his close up. My father opened the motel door in act of over exaggeration like he was my faithful manservant. He bowed deeply as I marched out the door. Silly parent, Penguin doesn’t have a butler. That business is for Bruce Wayne. Penguin is a Super Villain and has henchmen to hold his doors. I honestly felt ten feet tall and bullet proof at that moment. I stood on the motel balcony expecting my parents to follow suit. Instead of obedient henchmen, I viewed my parents staring back at me as if they were waiting for me to do something grand. The Big Guy had a smile like he was a secret agent who had just completed his most dangerous mission yet. My mother’s composure was pleasant but I could see some cracks forming as if she was nervous about something. It was like my mom could see five minutes into the future and was contemplating conflict resolution. Fear began to creep in, My idiot parents were holding me back from this great Fall Gala Pageant going on downstairs. I should already be in that ballroom with the beautiful people hobnobbing. Also my level of self awareness changed, suddenly, I morphed from smooth criminal to idiot wearing a vinyl pants suit. To make matters worse, I began to collect an entourage along the hotel balcony. I was not prepared for this type of audience and my composure began to wither. It’s hard to look the same criminal mastermind who corrupts Gotham City when Ma and Pa Kettle semi-retired from Sarasota, FL are cheering you on. My father’s throat clearing broke the uncomfortable silence that was building. The puzzled look on the Big Guy’s face silently signaled my mother to begin damage control. A sickly feeling began to rise in the pit of my stomach. There was no Fall Festival Gala and Ball for me to attend! My parents, in their guilt, were trying to substitute trick-or-treating the neighborhood by merely knocking on our motel door! Tears were choked back as I slowly realized that the impending crime spree would be limited to one small haul courtesy of an eager father. At that same moment, I suddenly understood why adults curse when they are upset. As much as I wanted to yell this word that I have heard my grandfather and dad say on numerous occasions, I knew better so I quietly thought it to myself. Like the defeated soldier I had become in this conflict of candy, I knew I had to keep my chin up and to accept what happens next or suffer the rage of a spurned father. My future did not hold any candy bars, full size or mini, no old ladies asking me who I was, or a bursting pail of candy that I could spend hours separating into “keepers” or “traders” with my pals. Every piece of candy I’d receive was on the other side of this dingy, gray motel room door. I took a deep breath, let out a little sigh, and knocked with very little heart in it due to overwhelming embarrassment. “Geez people, I just knocked on a stupid door.” I said softly to myself. had forgotten that he’d sent his firstborn out on a motel balcony only to gather a crowd of perfect strangers which seems to go against only several parental rules that had been beaten into my head since Mrs. Robert’s kindergarten class. My inner dialogue was going a mile a minute. “Trick or Treat.” I almost mumbled. The Big Guy was apparently really getting into the role of Astonished-Trick- or-Treatee #1. Yeah for me…. I resigned myself to play along and get this over with much like going limp on the playground when Andrea Muller used to chase me to kiss me. Maybe Dad will lose interest just like Andrea. Not bloody likely. I bellowed out my response with such mock enthusiasm and a smile that I was shocked when I didn’t get corrected. I guess the dead look on the Penguin mask was useful after all. More applause. Geez, Louise, haven’t these people heard of cable? Like I had said the secret password, the Big Guy ushered me in and presented with an orange jack-o-lantern that was pretty hefty from the amount of candy. “Show what show?” I thought. Like a ton of bricks, it hit me because I was so absorbed in my quest for candy, I had forgotten about what was about to come on ABC. For a brief period, The Six Million Dollar Man was on every Friday night at 9pm until garnered high ratings and was moved to Sundays. How could I had forgotten? A little candy over an episode of Lee Majors thwarting Soviet spies might just save my evening. Before Star Wars, this was my first pop culture obsession. As I look back at this night, I can’t even remember one single piece of candy that I ate. Did I eat a Snickers or a Milky Way? No clue. The funny thing that in all my greed to get candy, I only remember one little detail. As I sat on the edge of the double occupancy bed that I’d be sharing with my faithful sleeping companion, Pluto, the Big Guy joined me. Dreaming in a world where I had my own bionic powers, I barely noticed it when my dad dropped a toy into my lap. “I forgot this,” said the Big Guy. 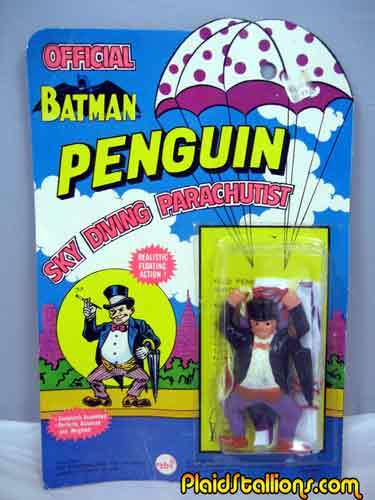 I looked down at my own Official Batman’s The Penguin Sky Diving Parachutist—now with realistic floating action. I’d been wanting one of these. I had mentioned this a few times when I saw it at Ryall’s Bakery which Mom and I visited sometimes when we went to pick Dad up from the library where he was the Asst. Director. The parachute was purple and this really cool umbrella sticking of it. Not too shabby. Maybe this night was not a total loss. Mom said it was too late for me to throw it tonight but I could get a few practice tries before leaving for Rock City in the morning. I began to think of new and exciting ways the Penguin could enter into his impending crime spree on Chattanooga. Didn’t Rock City have this huge cliff called Lover’s Leap? Ideas began to percolate until the Big Guy put a kibosh on that (though he did admit it’d probably be pretty cool). All in all, it was a pretty decent trip. In retrospect, I know the Big Guy was just trying to make some family memories for us. I am much older now and can see we are cut from the same cloth. Basically, we are big kids, over eager as adults, trying to share this crazy world with our kids. We both have the gift of tunnel vision in order to create those amazing family memories which are long and vast. These days I go out of my way to restrain my imagination/expectations which have root in seven year old Robby while trying to balance out my new found Alpha Male role now that I am the “Big Guy”. I also remind myself that while I have forty plus years of experience, I can still be outsmarted on occasion just like on a those rare occasions when I pulled over the Big Guy. I am a firm believer in that no one wins them all and on occasions it the ball swings the other way. Here’s why. It goes without saying which camp my father came from. He felt that between parking and admission prices that there was no way in hell, he’d be a part of advertising those rip off artists for free. The whole trip up he kept going on about reminding him to pull the visor down. I thought it’d be kind of cool like a badge of honor displaying the scenic vista the Richardsons had visited. Once again, little Robby’s opinion was taken under advisement but not followed. My young mind wanted to retort with what an amazing haul those bandits would receive. Their loot would consist of a worn out eight track of Glen Campbell and a snack bag filled with mealy apples and red hots. Banner day for the criminal world. I opted to keep my mouth shut and go get my gum. This was crack to me as a kid. It squirts when you bite it! After shoving two pieces of spearmint Freshen Up in my mouth I somehow got transfixed on the windshield. A devious thought crept into my mind. I know the Big Guy tried to make up for last night but somehow I still felt slighted and I still wanted justice. My conscience was torn but I knew what I had to do. After spending a full day shoving through the Fatman’s Squeeze, crossing rope bridges, and the Fairy Tale Village which was way creepier than it should have been, we returned to find the Gran Torino had received the full family value treatment: Two bumper stickers on the rear bumper and the dreaded metal sign on the front. It appeared the Rock City Parking Lot Attendant was a few steps ahead of the Big Guy. Score! The Richardson wagon train home was uneventful and not that painfully drawn out. The hardest part was stifling the huge laugh I had as the Big Guy ranted from Tennessee well into the Milledgeville city limits. I also learned some new words that I couldn’t wait to drop on the playground well out of the teacher’s ear shot. My return to Northside Elementary was quietly as my friends filled me in their Halloween evening. It was OK but apparently I did not miss anything grand. I even got cool points with my new Penguin parachute toy and for a while was the leader of the pack. At least I was until Keith Wray went back to the 7-11 and bought more Six Million Dollar Man trading cards.